Pinheiros Altos is a highly original course with two sets of nine holes that have completely opposing characteristics. The spacious practice area is frequently used by a number of professional golfers in the period before the tournament season begins. This is a highly original and distinctive course, with three sets of nine holes that possess completely opposing characteristics. Each nine holes is a PAR 36 and named: The Pines is named after the abundance of pine trees which abound the course, this nine includes four of the new holes opened in January 2007 and five of the original front nine. 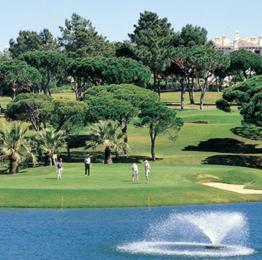 The Corks is the longer of the three nine holes at Pinheiros Altos and regarded as the most demanding. The Olives formed the original back nine and has remained unchanged since the island green eighth hole was constructed in 1995. Since its inauguration in June 1992, the course has gained a reputation as the favourite pre-season practice ground for several of today’s top professional golfers. They are drawn to the large practice ground which includes three putting greens, areas for bunker, chip shots and several greens. There are also comprehensive programmes of tuition for golfers of all levels. Weekly programmes with individual lessons include video analysis of golfers’ swings.